Written on 04 May 2015 . You can use Blogger's video uploading tool or an outside source (like Photobucket or YouTube) to upload video to your blog. I prefer to use Photobucket to upload my videos. Why? Because the Blogger uploading tool takes several minutes (10+) to upload a 15 second video on my computer. It may be easier, but it drives me crazy. 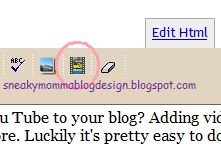 If you are using the new editor, you will need to switch to the old editor in order to load a video via Blogger. You can easily switch to the old editor by going to your dashboard-->settings-->basic and scrolling all the way down. Select 'old editor' and save. When you are ready to switch back, just repeat the process selecting 'updated editor' instead. 3. Browse your files for the video you'd like to use. To my knowledge, you cannot use the Blogger tool to upload video from anywhere other than your own computer. 5. Read the terms and conditions. If you agree, check the box. If not, refer to the other sets of instructions below. 6. Click on Upload Video. It may take several minutes for your video to load. 2. Copy the HTML code. Make sure to copy the whole thing. 3. Open your post and click on 'edit HTML'. 4. Paste the html code of your video wherever you'd like to put it. If you'd like to center your video, type in <center> at the beginning of the code and </center> at the end. 5. Preview and publish when ready. 1. Find the video that you want to put in your post. 2. 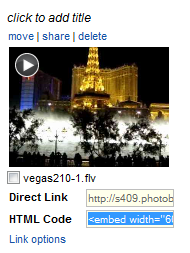 Copy the 'embed' code (to the right of the video). Make sure to highlight the whole code. 3. Open/create your post. Click on 'edit html' and paste the embed code wherever you'd like your video to appear. If you'd like to center your video, type in <center> at the beginning of the code and </center> at the end. 4. Preview and publish when ready.